Hello, there! My name is Tricia Ebarvia, and since 2001, I have been teaching high school English outside of Philadelphia, Pennsylvania. I serve as Department Chair and currently teach American Literature, AP English Language & Composition, and AP Seminar. AS AN EDUCATOR, I believe that developing a love of learning begins by centering students’ natural curiosity and nurturing a love of reading—a love I try to foster each day in the classroom. I also believe that developing student voice is not only an important skill in writing, but a necessary one for students to become engaged, informed citizens. Each year, I invite students to ask me questions, usually via index card during the opening week of school. Inevitably, a student asks what my dream job would be. It’s an interesting question, because it assumes that my dream job would be something other than teaching. But the truth is, I can’t imagine doing anything else but teaching. I’ve always believed teaching to be a vocation—from the Old French, “a calling”—and not just a job. 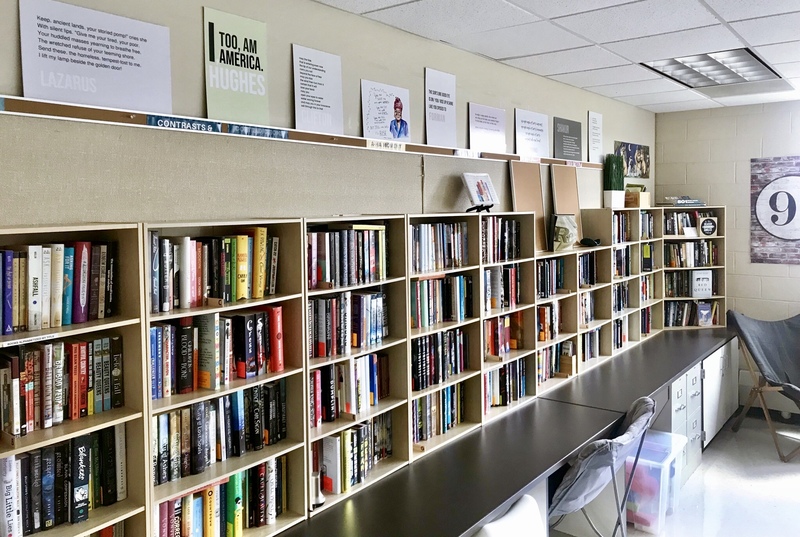 My classroom library: if you build it, they will come. My hope for my students is that they, too, find their calling, that they find a purpose—a purpose that inspires them to work hard, that contributes positively to the world by making the lives of others better. We are, after all, ultimately bound up in the welfare of each other; we are, as Gwendolyn Brooks reminds us, “each other’s harvest . . . business . . . magnitude and bond.” I believe that teachers and students, in community with one another in classrooms everywhere, can be a powerful and transformative force for good. Each day, I walk into the classroom and do my best to help students develop the skills they need not for the world as it is, but for the kind of world I think we all want—one built on the foundations of empathy, compassion, service, and justice. IN ADDITION TO TEACHING, I am also the faculty co-advisor for the senior class and the faculty sponsor of our school’s TED Talks student organization, the Asian American Cultural Society, and Students Against Gun Violence. I also participate on various district curriculum and technology committees. Outside of school, I serve as a Co-Director for the Pennsylvania Writing and Literature Project (PAWLP), a site of the National Writing Project (NWP). In addition to my blog here, I contribute to the “From the Classroom” column on the PAWLP website and monthly to MovingWriters.org. My writing has also been published in English Journal, Literacy Today, and Education Week. In May 2016, I was named to the second cohort of Heinemann Fellows, an action-research “think tank” of teachers led by Ellin Keene. In 2018, I co-founded the anti-bias, anti-racist pedagogy effort #DisruptTexts with the goal of advocating for more inclusive and equitable curricula and pedagogies. Currently, I also provide professional development to teachers and school districts in my role as a literacy consultant and teaching fellow with The Educator Collaborative. OUTSIDE THE CLASSROOM, you can find me spending time with my husband as we raise our three boys. Because they are growing up too fast, I document our lives through my passion for photography. Our young Jedi-in-training remind me every day that learning can be—and should be—filled with wonder and joy. I love learning from fellow educators. Feel free to connect with me on social media or contact me directly at tricia.ebarvia@gmail.com. NOTE: Please note that opinions expressed here and elsewhere are my own and not necessarily reflective of any of my employers or other affiliations.